In Montessori Elementary, the child's own questions provide the basis for exploration of the world. He wants to know everything about everything. He has a natural tendency to explore the expansive "cosmic" perspective within disciplines such as the sciences, the arts, and social studies. To study is to be immersed in nothing more or less than the infinite domain of the universe. The "cosmic" perspective does not mean, however, that Montessori elementary ignores the "basics" of reading, writing and arithmetic. During the preschool years, the Montessori child has already acquired a beginning literacy of letters, numbers, and writing. In the elementary years, these basic skills are polished in the meaningful context of a "big picture." The child's own philosophical spirit motivates skill mastery. The Great Lessons are connected stories that span the enormous historical frames of time and space. "The Coming of Life" introduces the history of life on earth from one-celled animals and plants to human beings. "The Coming of Humans" relates the significance of human beings, their special abilities, and what differentiates them from other life forms. "The Story of Communication in Signs" and "The Story of Numbers" provide a look at human invention in the context of expanding civilization. From this core of story frameworks emanate the details of the disciplines: science, mathematics, social studies and language. The story provides an overview; the children then investigate the disciplines in detail. Because of the unifying thread of the Great Lessons, no subject is studied in isolation from the others. Knowledge is intertwined even though discrete in its parts. The Montessori Elementary balances the child's developing imagination and powers of abstraction with down-to-earth, concrete, hands-on materials. Each material has its structured sequences designed to lead to discovery and understanding. The elementary-aged child is moving from an understanding of the physical world to an understanding of abstract concepts. 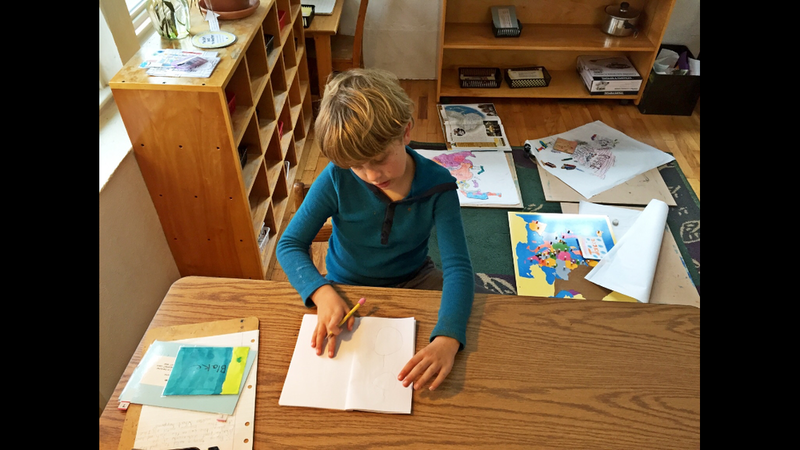 Montessori provides diverse and creative passages to abstraction. Mathematics, for instance, is presented through three-dimensional, manipulative materials that reveal simultaneously arithmetic, geometric, and algebraic correlations- each providing a concrete way to experience an abstract concept. Likewise, the grammar materials use symbols and visual patterns to help the child discover parts of speech and analyze the structure, style and logic of sentences. These exercises refine reading and writing skill and lay the foundation for foreign language study. Because no classroom can contain the answers to all of the child's questions, "going out" is a response to the need to explore beyond the classroom. In contrast with the traditional field trip, where the adult usually plans the activity for the whole class, the "going out" of Montessori elementary children is based on individual or small-group interest in extensions of classroom study. Whether it be a walk to the public library for more specific books on earthworms or a trip to the art museum to see Japanese paintings, children "going out" plan their own excursions, call the institutions to be visited, and work out their transportation needs. Another part of "going out" can be service projects such as visiting the elderly, cleaning up the environment, or holding a food drive for the hungry. At a psychological level, these projects build the child's sense of social purpose and moral responsibility.